When you decide to incorporate some houseplants, you should add them at the beginning of the month or the New Year. This time signifies a new start for your family and your house. The most important factor in selecting indoor plants is their overall health. If you have a brown thumb, you want to pick easy to care for plants. A plant that is struggling to survive will put out bad Feng Shui. Areca Palm is a favorite palm plant with feathery, arching leaflets. One plant can have over 100 leaflets. It is a large plant with a mature height of six to seven feet. They are ideal for people with little plant experience and can tolerate trimmings easily. Most Areca Palms can live up to 10 years. There are some great reasons to add an Areca Palm to your house. They can remove indoor air toxins, creating a healthier environment for your family. Their leaves have a flow that helps to soften the energy of your home. If you have a room with carpeting or have recently varnished furniture, an Areca Palm can remove xylene and formaldehyde from the air. Lady Palm is another great option for a Feng Shui indoor plant. It is another large, palm tree that can grow to six feet inside and up to 12 feet outside. You must keep your lady palm in an area out of direct sunlight, and in an area that has a steady temperature of between 60 and 80 F. They need to be repotted every two years, increasing the size of the pot until the plant is as you want it to reach. Bamboo Palm indoor plants are another great choice that many people enjoy. They grow tall, often between the heights of three and 12 feet. They can be as broad as three to five feet. Their leaves are a dark green color and stand straight. Those without a green thumb is especially fond of Bamboo Palm plants because they require little time or energy. You need to use room temperature to water them when the soil feels dry. Bamboo Palm trees can remove Benzene, Trichloroethylene, and Formaldehyde in the air. They add a peaceful and tropical feel to the room you place the plant. They are resistant to most insect infestations, although you do need to watch out for mites on the underside of their leaves. Rubber Tree Plants are a unique plant that stands out in any room. They stand tall. When placed outside, they can grow up to 50 feet tall. When planted inside, they are considerably smaller, but they do require a good deal of sunlight. They need a healthy balance of water and sunlight. A perfect place to put a rubber tree plant is near a window with a sheer curtain that will block some, but not all, of the light. Feng Shui advisors love rubber tree plants because they are excellent at removing pollutants, especially formaldehyde. Although they do like sunlight, they can survive with less light and in cooler temperatures. 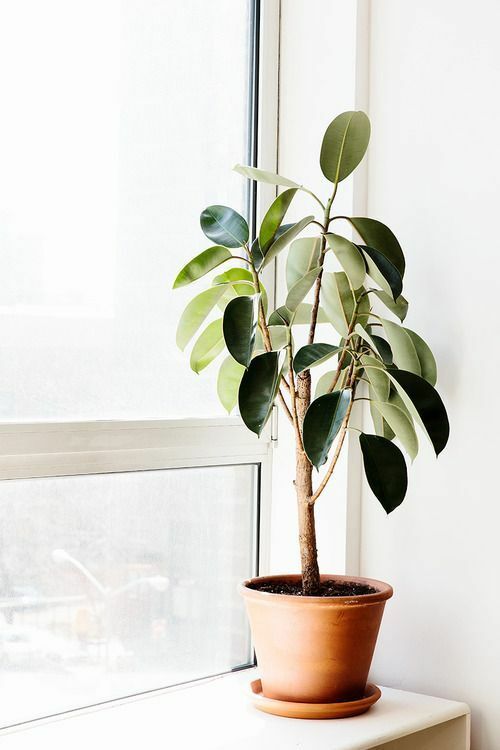 A rubber tree plant is an excellent choice for space with a lot of indoor toxins. Dracaena Janet Craig plants are ideal for those with little time to care for a plant. They do well with little care and low light. They need a little water to survive. Dracaena plants have sword-shaped, leathery, dark green leaves that are around two feet in length. However, it is believed to be poisonous for cats and dogs, so it may be wise to avoid it if you have these animals. Followers of Feng Shui can find many benefits from a Dracaena Janet Craig Plant. This floor plant can remove many toxins from the indoor air such as formaldehyde, xylene, and trichloroethylene. It is one of the best options for removing office chemical toxins. Also, the dark green plant is attractive in any space. English Ivy is the most common type of ivy chosen for house plants. Growing ivy indoors is simple, so long as you provide it with the necessary components. All varieties of ivy, including English Ivy, need plenty of bright light. Without proper light, you will notice your ivy plants will look sick and leggy. They will also be more prone to infestations. English ivy is an excellent choice for a hanging plant. They work perfectly for removing benzene commonly found in plastics and inks. It would be a great addition to your office space. They also control the toxins from carpets and paint, such as formaldehyde. English ivy is a hardy plant, often used in public areas. You will find it adapts well and handles most environments well. Adding a few Feng Shui indoor plants throughout your home or office space is an excellent way to remove negative energy and dangerous toxins from chemicals. Simple items, such as carpet or newspapers, emit forms of toxins. All of the six plants listed above can help remove those chemicals from your home. Taking good care of your houseplants is important. A sickly houseplant will produce negative energy in your home. Provide all plants with an adequate amount of light and water. It is a wise idea to spend some time understanding the requirements, such as how often to repot, before purchasing an indoor plant. We hope this list was hopeful for you! Let us know what Feng Shui indoor plants you have in your home.